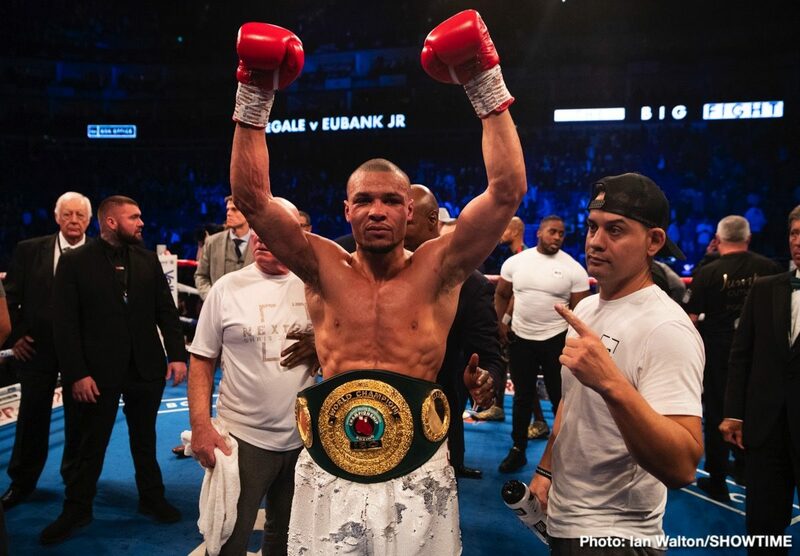 Chris Eubank Jr. (28-2, 21 KOs) had too much youth, speed and talent for former IBF super middleweight champion James ‘Chunky’ DeGale (25-3-1, 15 KOs) in beating him by a 12 round unanimous decision tonight in their long awaited match on SHOWTIME at the O2 Arena in London, England. DeGale, 33, tasted the canvas in round 2 and 10, and was hurt numerous times during the fight from the hard shots from the 29-year-old Eubank Jr. DeGale was over-matched from the start in the fight, and he couldn’t do anything to be competitive. In looking at this performance and comparing it to the fighter that had dominated dominated the 168 lb division from 2013 to 2015, it was like watching a completely different fighter. Eubank Jr. scored knockdowns in round 2 and 10, both of which seemed bogus. They looked like cheap knockdowns. The scores were 114-112, 115-112, and 117-109. DeGale fought well enough to win two rounds on Boxing 247’s scorecards. The fight followed a pattern in which DeGale would fight well through the first three-fourths of the round, but then Eubank Jr. would come alive in the last 15 to 20 seconds to steal the round with his late flurries. The way that Eubank Jr. chose not to fight hard for the full three minute rounds, you can blame that on laziness on his part or perhaps a lack of motivation or focus. Whatever it was, Eubank Jr. is going to have to fix that problem when he gets in with better fighters in the super middleweight division. Eubank Jr. can’t be lazy against guys like Callum Smith, because he’ll get knocked out if he lets him have his way for majority of the rounds. 2016 Olympic super heavyweight Silver medalist Joe Joyce (8-0, 8 KOs) used his size, power and work rate to wear down and stop the out of shape 273 pound former World Boxing Council heavyweight champion Bermane Stiverne )25-4-1, 21 KO). Joyce, who goes by the nickname, ‘Juggernaut,’ knocked the 40-year-old Stiverne down in the third round, and then teed off on him until referee Howard Foster waived off the fight in the sixth round at 2:20 of the round. Stiverne was ready to be pulled out of the fight at the time that Foster stopped the contest. Stiverne had taken so many heavy shots in the fight. It needed to be stopped at that point to protect him from further harm. Joyce looked like a young George Foreman in battering Stiverne from pillor to post for the entire fight. Stiverne showed that he still has a lot of punching power, but Joyce was willing to take his best shots without getting hurt by them. The constant flow of heavy shots from Joyce kept Stiverne from being able to throw as many as he’d like to have. It didn’t help that Stiverne was in such bad shape. Even if Stiverne had wanted to, he probably wouldn’t have been able to throw more punches. He was too fat. Former International Boxing Federation featherweight champion Lee Selby (27-2, 9 KOs) fought for the first time at lightweight in beating Omar Douglas (19-3, 13 KOs) by a 12 round unanimous decision in a tune-up fight. Selby, 32, was coming off of a defeat at the hands of Jose Warrington in his previous fight, and needed a constant booster in taking on gatekeeper Douglas tonight, but this fight turned out to be a lot harder than anyone expected it to be. Selby was constantly pressured by the younger and stronger Douglas, and he was forced to do a lot of holding to keep from getting beaten up. The judges’ score were 116-112, 116-112, and 115-114. Boxing 247 saw it was a win for Selby by the score 116-112. Selby won the fight, but it was not the kind of performance that you would like to see from a former featherweight world champion making his first fight in a new division. It’s not a good sign that Selby couldn’t easily beat a guy like Douglas. With sharks like Teofimo Lopez and Vasyl Lomachenko swimming about in the lightweight division, Selby looked like a minnow tonight. He doesn’t not look like he belongs in the lightweight division. At this point in Selby’s career, he looks like a domestic level guy. Selby suffered a cut over his left eye in round 2, and then later another cut over his right eye in round 7. The cuts weren’t the reason why Selby fought so poorly. He just looks old, weak and not cut out to be fighting at lightweight or even super featherweight. A good fight for Selby right now would be against someone like Ricky Burns.